Delicious dried cranberries, apricots, blueberries, cherries and apples are expertly covered in colorful, flavorful milk and white chocolate. 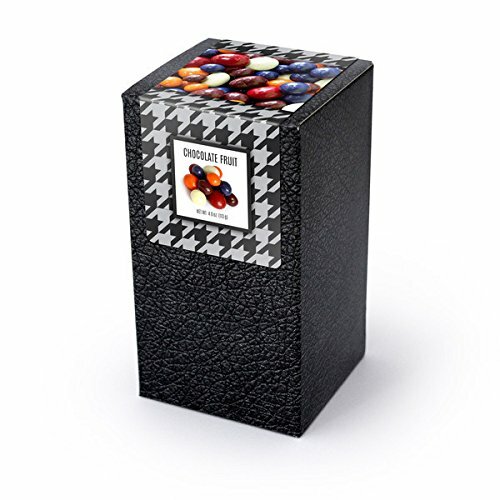 Our black faux leather box is an exciting twist on a classic. It features a product label to seal the top and an auto-bottom in an effort limit tampering. We use recycled fiberboard and soy ink whenever possible to offer our customers a sustainable, eco-friendly product. We print our boxes on recycled cardboard and utilize soy-based ink whenever we can. If you have any questions about this product by In-Room Plus, Inc., contact us by completing and submitting the form below. If you are looking for a specif part number, please include it with your message.